Medicines taken orally are diffused throughout the entire body before they get to the source of your pain and start working to relieve it. Now, instead of having to ingest vast quantities of drugs, we have the ability to get medicine to exactly where it’s needed to reduce pain: the spinal cord. Surgically implanting a pump under the skin in your abdomen, and running a catheter to the exact location in the spine where the pain is located, we can pump medication directly into the spinal fluid, which causes a powerful effect on the spinal cord. This technique not only drastically cuts down the doses of medication required, but the medication used provides better pain relief with fewer side effects. What is a Spinal Pain Pump? 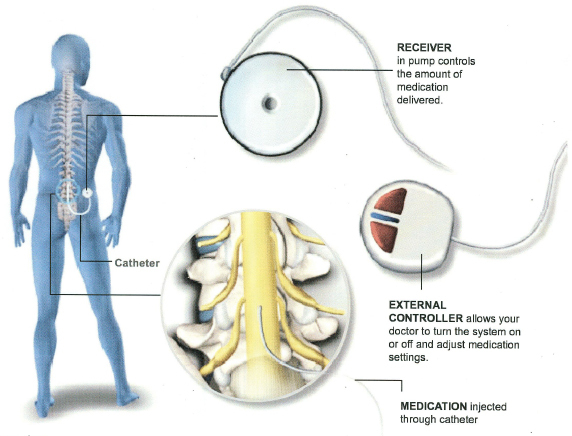 An Intrathecal Pump or spinal pain pump is a device that delivers concentrated amounts of medication(s) into spinal fluid area through a small catheter. Am I a candidate for Intrathecal Pump Implant? 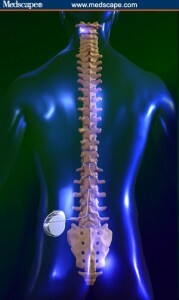 Spine Institute Northwest offers this procedure to patients with chronic and severe pain who have not sufficiently responded to other treatments. Patients who have been failed by either oral or IV medications or had severe side effects from these treatments may also be candidates. The device delivers medication continually, eliminating or minimizing breakthrough pain and other symptoms. It allows patients better pain relief and control over spasm, and it decreases if not eliminates the need for medications taken orally. The procedure is done in two stages. In the first stage sees an injection or temporary catheter inserted to test for effectiveness and be a precursor for side effects. If this trial relieves your symptoms, then the second stage can occur, where a permanent device can be positioned. The procedure involves inserting a needle through not only the skin, but deeper tissues as well so, there is mild discomfort involved, not unlike the discomfort felt with a flu shot. The skin and tissues are numbed before the procedure and most of the patients also receive IV sedation and pain medications throughout the procedure. Do I have to be “put out” during this procedure? For many, yes. The placement of the tubing is done under a local anesthesia. You will be mildly sedated throughout the procedure, but the amount of sedation given will depend on your tolerance and comfort level. For the pump placement, you are given either a spinal injection or general anesthesia depending on your general health. How do you do the procedure? he procedure is done with the patient lying on the stomach, while being monitored with EKG, a blood pressure cuff and blood oxygen-monitoring device. After the skin is cleaned, the procedure is carried out. Fluoroscopy is used to help guide the needle for inserting the tubing. Tubing is introduced in the midline at the lower back. The pump is positioned on the side of your back. You may have acute incisional pain after the procedure, like with any procedure of this nature. The pump is adjusted electronically to deliver the proper amount of medication to control your pain. This procedure takes a couple of hours to complete. After a short recuperative period and the pump adjustment, you are free to go. The medication enclosed in the pump lasts between 1 to 6 months depending upon its concentration and amount infused each day. It is refilled through a needle inserted into the pump chamber, which is done in the office and takes only a few minutes. The batteries in the pump may last up to seven years depend upon how much they are used; they cannot be recharged or replaced so when they fail, a new pump will be fitted. Will this Spinal Morphine Pump help me? It is impossible to determine if this procedure is right for you or not, which is why a trial is carried out to explore if a permanent device is the answer for relief of your chronic pain. What are the risks/ side effects? This procedure is generally a safe one, but as with any procedure there are risks, complications and side effects that may be associated with it. It is a good idea to discuss any concerns with your physician. There are a lot of tests and screening efforts in effect before a pump can be implanted into your body. If you are on blood thinning medications or if you have an active infection this procedure may not be the right one for you. More information is available from the device manufacturer of this device. Additional information is also available at the Medtronic’sTM Website.